One of the more interesting books in all the Bible is 1 Timothy. In this book, Paul is writing to someone who is his “son.” Not actually his son, in the biological sense, but in the spiritual sense. Timothy is a young man who Paul helped mentor in the faith. 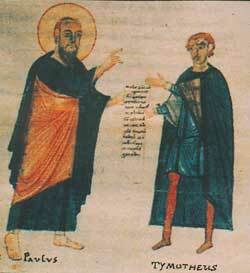 He was someone who Paul walked beside, that Paul taught, that Paul helped to grow in the faith and become a leader. He was someone who Paul really loved, and he was someone who really looked up to Paul. So, Paul wrote him this letter as a way to share with him what he knew to be important. Paul knew that Timothy was a preacher and a teacher, and that Timothy would be leading others in the way of Jesus and would be teaching them about what was most important. Paul knew that Timothy needed to know what those most important things were to share with his people. This letter is Paul’s way of sharing with his spiritual son what was most important. The purpose of my instruction is that all believers would be filled with love that comes from a pure heart, a clear conscience, and genuine faith. But some people have missed this whole point. They have turned away from these things and spend their time in meaningless discussions. Paul tells him that the point of it all is to be filled with that love that comes from a pure heart and clear conscience. That’s what God wants for us and from us. As we are filled with His Spirit and His love, we will be impacted by God and will be able to impact the world in amazing ways. That’s what matters most. That’s what is most important. Being filled with God so that we can know Him better and show His love to all persons. Being filled with His power, His love, His vision, His passion – being filled completely with God. Everything else misses the point. That’s what it is all about. Knowing God and being known by God. Loving God and being loved by God. And loving each other with that love of Jesus. Let’s not get bogged down in the things that miss the point. Let’s focus on Jesus, on knowing Him better each moment and being filled with His power and presence. That’s what it is all about. That’s what matters. And let’s focus on that.